Sometimes water may appear in the bottom of the fridge. This is usually caused when water created by automatic defrosting cannot run away through the hole in the channel at the back and it runs into the base of the fridge instead. 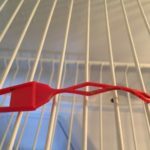 At the back of many fridges and fridge freezers these days is a sloping channel or two smaller sloping channels leading into a hole. During normal operation the back wall gets covered in ice, or beads of ice which needs regularly defrosting. Automatic defrosting slowly warms up the back wall at regular intervals and the ice melts. The water then runs down the back wall into the channel and down the hole. This water then runs out to the back of the fridge and is directed into a small evaporation tray sitting on top of the main compressor. 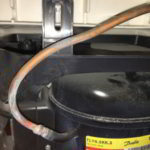 Heat from the compressor evaporates it away. See the photo to the right which shows a large plastic tray on top of the main compressor. This is where the water should run into ready to be slowly evaporated away. Fridges like this should come with a small plastic tool for clearing the hole. Sometimes the tool might be supplied as an accessory or it might come already fitted inside the hole. 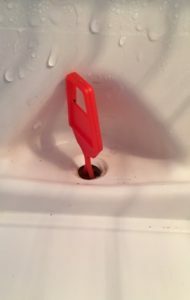 If the plastic tool is already in the hole it’s clearly been designed to be there. Lift it out occasionally, push it up and down inside the hole and remove and clean it. If the tool was supplied in a separate bag keep it somewhere handy and use it occasionally to ensure the hole is nice and clear. Sometimes a blockage is made up of solid ice, which can be melted, but if it returns then something is clearly going wrong because this water should not be freezing. Call an engineer. Can’t find the drain hole? As described above it should be right at the back, and bottom of the fridge inside. 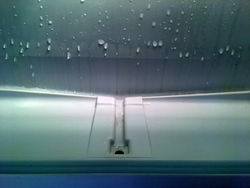 If you can’t see a drain hole, check that it isn’t hidden – as it is on my own (Neff) fridge. Mine is hidden underneath a plastic shelf that covers the salad compartment. Sliding forward this cover reveals two sloping channels plus an extra channel leading to the drain hole. The photo accompanying this paragraph shows the base of my fridge with the plastic shelf removed. Try pushing something different through the hole to make sure it’s properly clear. If the hole is blocking with ice though and you have the stat set properly so that the fridge maintains 5 ° temperature there could be a fault that needs an engineer to fix. I have a Hotpoint future defrosting upright fridge freezer. Lately there has been ice forming in bottom of freezer and water coming out when door opened . I took plastic cover off at inside rear found channel with hole in middle( about 15 mm) iced over. Tried melting this but don’t know how far this goes, couldn’t get to bottom . Can this pipe be accessed from rear of freezer?? I have a built-in fridge and I understand that water will collect in the evaporation tray… My question is where does all that evaporation go afterwards, given that the fridge is sealed between the cupboards and the wall! If the evaporation just stays behind the fridge, then it would be reasonable to expect mould etc behind the fridge if I dare to slide it out…. Am I missing something? Good question Christopher. The water in the evaporation tray literally evaporates. The water will just evaporate into the surrounding air. Even though it’s built in there will still be air all around it at the back. If it’s in a cold place it my condense onto surrounding cold areas but it’s not an issue I’m aware that causes any problems. Hello Gemma. It doesn’t need to be too hot. Warm water would easily melt ice. Even cold water will melt ice.